PowerPoint has now turned 20 years old, and users and audiences everywhere seem to be uttering more weary groans than wishes for many happy returns. So, what's the problem? After all, it's a powerful tool with plenty of features and lots of flexibility, which is now a ubiquitous de facto standard accepted pretty much anywhere - everything one needs to make a great presentation! The problem is that PowerPoint is an enabler - in the negative, alcoholics-anonymous sense of the word. All those bells and whistles can make a presentation out of nothing at all - add some animations, sound effects, slide transitions, clip art, crazy fonts, gradient backgrounds, corporate logo, page number, and weird art-deco theme elements - and pretty soon, there's no need for any content! Before (or simply without) PowerPoint, there was no easy way to add filler, to take time and space; the only option was to actually present real information and ideas. While I could rant about PowerPoint all day (believe me), I'd rather end on a constructive note. What can audiences do to save themselves from a slow and horrible death by slideshow? Well, if they have any control over the presenters - if the presenters are students, clients, subordinates of any type - simply disallow PowerPoint at all unless there's a compelling need. (Hint: lists of bullet points are never needed!) If there's a need for photos, illustrations, or visual data, limit slides strictly to that. And if you need to be more open about the usual stuff (bullet points, come on in), the just ban the most grievous offenders - animations, decorative-only clip art, sound effects, and slide transition effects. There's a fine line between giving users the power they need, and the kind of power that can be used as a crutch. Here's hoping that in the next 20 years, PowerPoint can find that line - and back up to it. 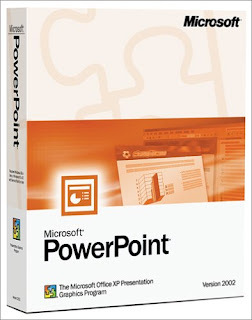 I think the worse problem within Power Point are those terribly ugly efects and templates.I think Microsoft should look for a smoother, more "flashy" presentation software. In addition to enabling talks with no content, power point is doing away with the art of speaking: one person, in front of a crowd, conveying information in an entertaining or interesting way. Now, people assume that what they put on the power point slides will be interesting or entertaining, and they can get by without developing their speaking skills. Unfortunately, power point is more distracting than it is entertaining, and often detracts from the information the speaker is trying to convey. Rafael- I definitely agree that the existing effects and templates are ugly, but even smoother and "flashy"-er versions of those can enable content to be pushed aside by style! s Guide to Speechwriting), I'm a bit worried about the future of the craft!